Canon aims at providing its customers with high-quality photo prints. Pixma MG2455 is an all in one photo inkjet printer dedicated for printing high definition photos at the ease of home. This model is recommended to amateur photographers and home users. MG2455 has a compact, sleek and stylish design with dimensions measuring 426 mm (W) x 306 mm (D) x 145 mm (H) and weighs as light as 3.5 kgs. The maximum printing optical resolution is up to 4800 x 600 dpi which provides clear and natural prints. The printing speed is up to 4 ipm for colour printing and 8 ipm for monochrome printing. The Canon Pixma MG2455 Ink Cartridges provide bright colours to the picture and its ink has high life on photo paper too. The input tray has a capacity of 60 sheets and it supports up to A4 and A5 sizes. Canon Pixma MG2455 supports smart web printing which enables the printer to directly print from the internet itself. The printer is cost effective as its cartridges deliver significantly more printing of pages and last longer between ink replacements thus saves considerately on each page print. The printer is well suited for home users since it prints without any noise thereby providing smooth functioning. Canon with its Pixma range aims at proving high-quality photo prints and MG2455 lives up to users expectations. The all in one printer, scanner and copier provide high-quality photos which have long life. With Canon Pixma MG2455 Ink Cartridges the photos get lively and bright colours and the ink doesn't fade away even on photo paper. Though the printer lacks networking and can only print through USB connection and direct web printing, the printer is cost effective and efficient product for amateur photographers and home users. Q. 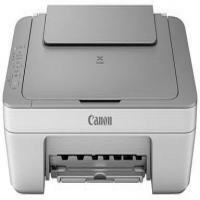 Is this Canon Pixma MG2455 printer budget friendly? A. Yes, this all-in-one photo inkjet printer is cost-effective in nature and produces good quality prints in less time. The printer is cost-effective as its compatible Canon Pixma MG2455 Ink Cartridges deliver significantly more printing of pages and last longer between ink replacements, thus saves considerately on each print. Q. I was carrying out my usual printing work and the machine stops in the middle. Please let me know the issue. What should I do in this situation? Check1: Is the paper loaded correctly? Make sure that paper is loaded. If the machine has run out of paper, load the paper that is recommended. Check2: Do the printing documents have lots of photographs or illustrations? When printing large data such as photos takes time for the machine and computer to process, the machine may appear to have stopped operating in such case. When printing data that uses a large amount of ink continuously on plain paper, the machine may pause temporarily. Wait until the process completes. Check3: Has the machine been printing continuously for a long period? If the machine has been printing continuously for long, the print head or other parts around it may overheat. The machine might stop for a period of time and then resume. Wait for a while without any operation. If the printing still does not resume, interrupt your print session at a convenient time and turn the machine off for at least 15 minutes. Check4: If copying stops in the middle of a printing job, try to copy again. If a certain time passes after some errors occurred while copying, the machine stops the operation. Q. Do you offer any guarantee if I purchase Canon Pixma MG2455 Ink Cartridges from this site? A. Yes, our company aims at providing 100% customer satisfaction guarantee. Each of our product and services is made in accordance to provide customers full flexibility to choose their items by providing easy return services. In the event that a compatible or remanufactured Canon Pixma MG2455 Ink Cartridge is deemed to be faulty, we will replace or refund the item from 12 months following the date of purchase. Q. Do you offer a multipack (black and colour) cartridges for the Canon MG2455? A.Yes we sell many variations for customer convenience, according to your printing needs. Simply type MG2455 into the cartridge search section of our site to find the options available. A. Hi Sarah, a genuine cartridge is one which has not been re manufactured or refilled. This makes the cartridge a little more expensive than the compatible version. Q. When I go to print a document on my lap top my printer (MG2455) is not in the list. A.To ensure that the document will print make sure the printer is installed on the device. This can be viewed in 'computer's devices'. Hit install. Ensure that the USB connection is working properly between the printer and your laptop. Hope this helps.